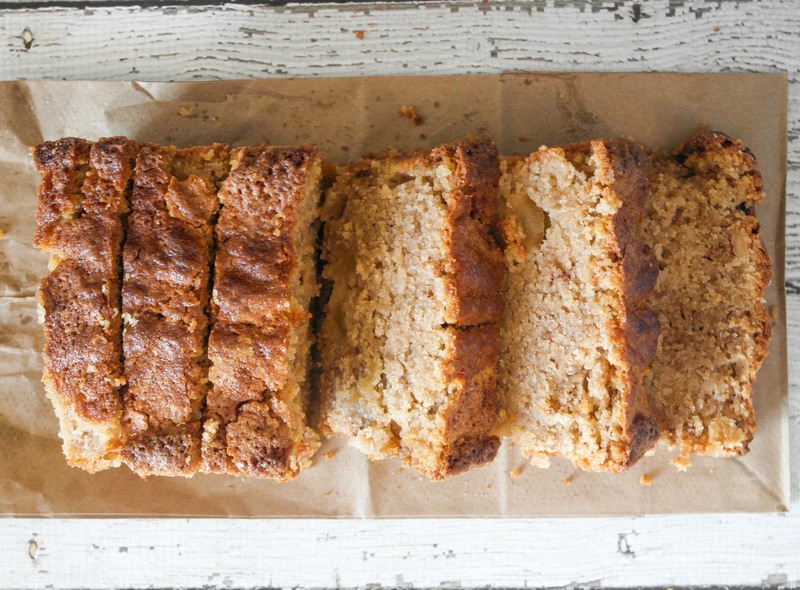 This spiced apple bread is positively bursting with fall-ness. 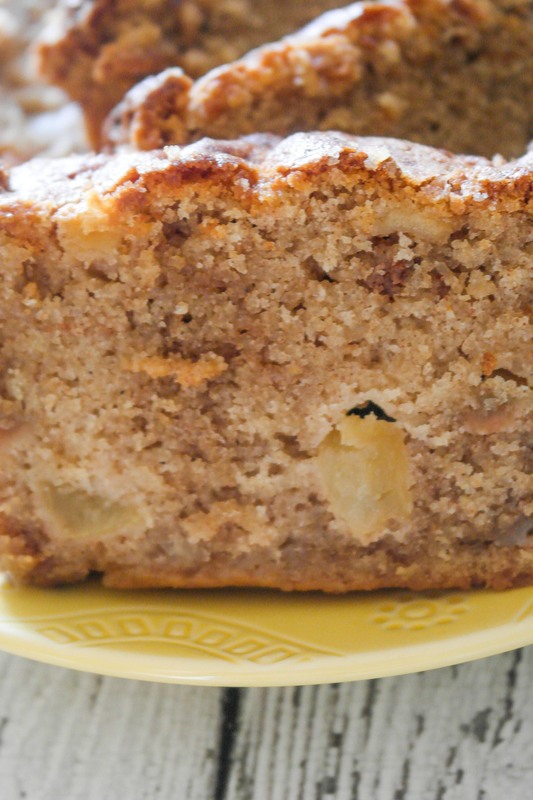 It is full of apple chunks, cinnamon and nutmeg. It is dense, moist and downright delicious. 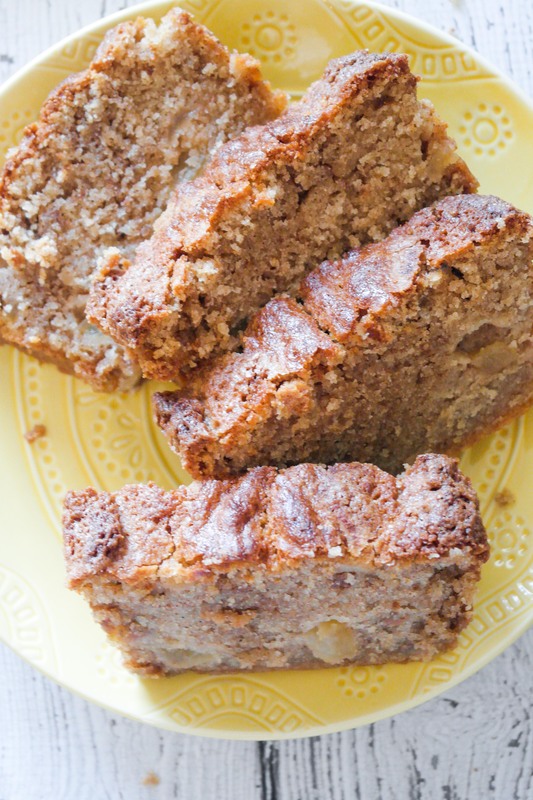 Welcome fall with this delightful dessert! I made this bread with a Honeycrisp apple that I bought at the farmer’s market. Honeycrisp apples are ideal for baking because they are outrageously crisp (hence the name) and firm, which means when they bake, they won’t get mushy or gooey. They soften certainly, but they don’t turn to mush. They also happen to be my favorite apple to munch on, so it was a win-win for everyone. 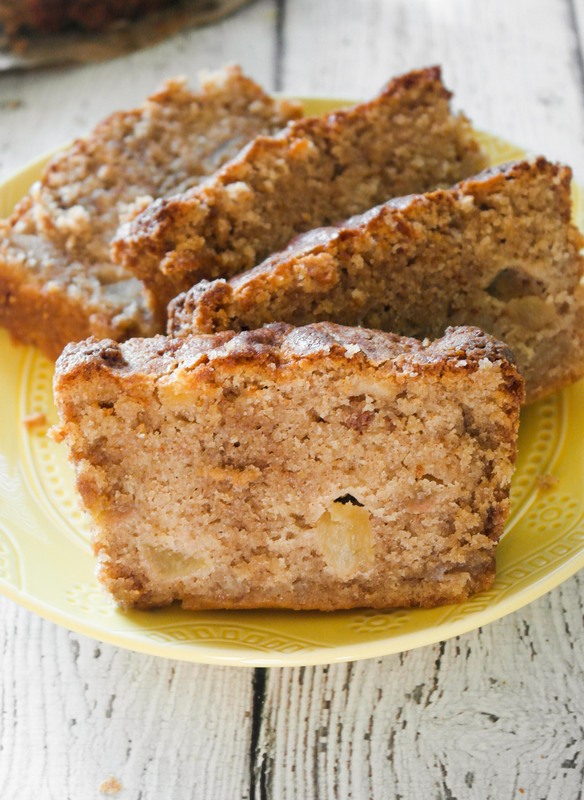 Some apple bread recipes have you layer the apples in. I did this for the first round of baking, but I think that weakened the overall structure of the bread. For the second round, I folded the apples directly into the batter. This did the trick! They baked evenly and gloriously throughout. Some side notes about the apples: I put one extra large Honeycrisp into the recipe. It was about a cup of apple; however, this bread could hold up to two cups of apple if you so wish! I chopped mine into pieces that were about a dime size; a few bigger pieces were about the size of a penny. Smaller pieces can sometimes disappear into the bread, but bigger pieces can make the bread more delicate. So, pick a happy medium! Look at those apple chunks! Ensure that you cream the butter for at least 5 minutes. 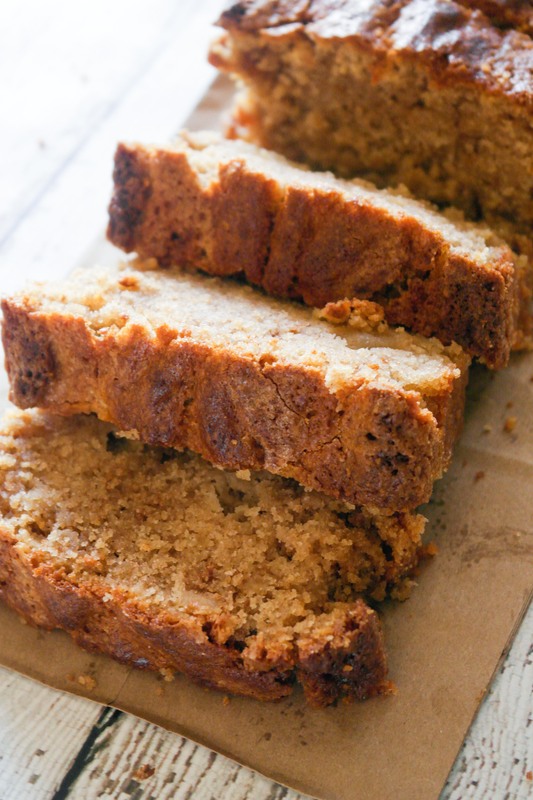 This cake doesn’t have a lot of leavening and leavening only acts on pre-existing air bubbles. By whipping the butter for five minutes, you add tons of air bubbles for the leavening to act on. Mix only until fully incorporated. Over mixing yields a chewy bread and you certainly don’t want that. Gently fold in the apples to prevent over mixing. I spray the bread pan with Pam and then I “sugar” it. My sugaring it, I mean dumping about a fourth of a cup of sugar into the sprayed pan and twisting and turning until the sugar covers the whole interior of the pan. This makes for a nice little sugary “crust” but it also pops out of the pan much easier. Now go make this because fall doesn’t last forever! Preheat the oven to 350 degrees F. Spray one bread pan with cooking spray and then sugar it with about a 1/4 cup of sugar. You will have extra which you can put back into the sugar jar. You may also spray the pan with cooking spray and then line it with parchment paper. First, peel and chop your apple. Mix the Tablespoon of brown sugar and dash of cinnamon with the apples. Set aside. Cream the butter and sugars in the bowl of an electric mixer fitted with the paddle attachment or a hand mixer, until light and fluffy, about 5 minutes in order to ensure that the cake has good lift. With the mixer on medium speed, add the eggs, one at a time; add the vanilla. In a separate bowl, sift together the flour, baking powder, baking soda, salt, nutmeg and cinnamon. Add the flour and buttermilk alternately to the batter, beginning and ending with the flour. Make sure not to over mix! Put a third of the mixture into the bread pan. Spread half of the brown sugar over this layer. Add another third and add the rest of the brown sugar. Top off with the rest of the batter. Bake for 60-75 minutes, or until a toothpick inserted in the center comes out clean.